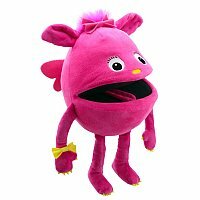 Baby Monster is as large as a melon with a huge mouth so they can talk, shout and sing (with a bit of help from you). If you don't want to give them voices the new air filled squeaker in the mouth will give you lots of different sounds. Baby Monster Â character is full of personality and fun, just itching to be played with. Check out more of the wacky designs and colors for Baby Monsters to suit all tastes. Height 13", Width 8", depth 8"